When you hear the term risk management, what comes to mind? Likely the first images are of hurricanes, fire or political unrest. 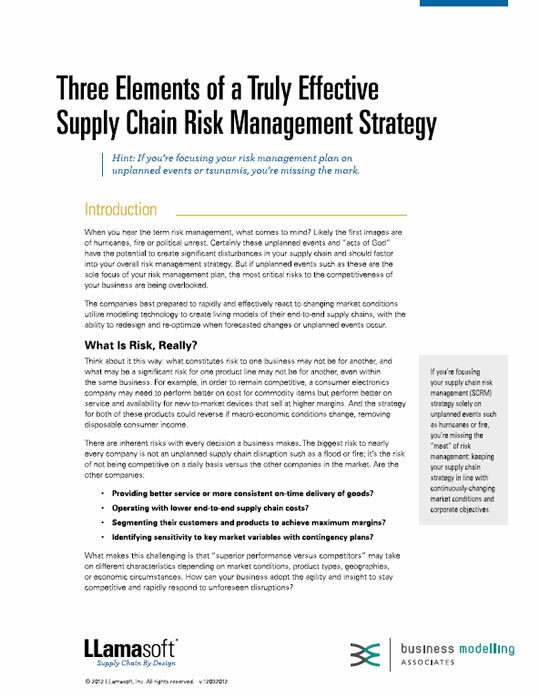 Certainly these unplanned events and “acts of God” have the potential to create significant disturbances in your supply chain and should factor into your overall risk management strategy. But if unplanned events such as these are the sole focus of your risk management plan, the most critical risks to the competitiveness of your business are being overlooked. The companies best prepared to rapidly and effectively react to changing market conditions utilize modeling technology to create living models of their end-to-end supply chains, with the ability to redesign and re-optimize when forecasted changes or unplanned events occur.